Funeral for a Dog is many things. It’s a novel about parallel searches for identity and meaning, a recording of the events of a five-day house party, a mystery about the death of a friend, and a chronicle of the slow decline of an elderly, three-legged dog. Scenes peppered with the funhouse imagery of carousels, roller coasters, and cotton candy alternate with those filled with dark foreboding. In Funeral for a Dog, Pletzinger delivers a challenging and innovative novel that asks more questions than it answers as it wallows in the kind of directionless seeking that has become a hallmark of postmodern fiction. This puzzle of a novel is filled with echoes, repetitions, and reflections, which are carefully preserved by Benjamin’s adept translation. In a Mobius-worthy trick, the last page of the novel loops right back to the first page. Rather than leading towards clarity, Funeral for a Dog proves clarity is an illusion. This high-energy read will frustrate some readers, but those willing to commit to the journey will be rewarded with an intelligent and creative portrayal of the intermingling of love and loss, life and death. 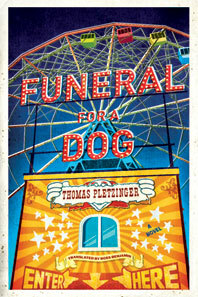 Funeral for a Dog by Thomas Pletzinger (translated by Ross Benjamin) is published in the United States by Norton. Gwendolyn Dawson is the founder of Literary License.